Songbird is no longer supported in Linux. However, unsupported Linux builds are still released. A few days back Songbird 1.8.0 was released. From, my previous experience, Songbird has never been a favorite of mine (not even close actually). So, I downloaded Songbird 1.8.0 for Linux, expecting to be confronted with the slow and bloated audio player again. Well, Songbird 1.8.0 is still very slow. After clicking on the Songbird, I have to wait for sometime for it to actually start. However, adding my songs to the library was not very slow and went fine. So, I went ahead, played a song and found that it did not automatically import the album arts which were in the folders already. Songbird can download the artworks (at least there was an option to do it). So I clicked on "Get Artwork" and Songbird kind of froze - the music was still playing but the UI was frozen. It was ok after about a minute, but still no artwork. Disappointing! I was listening to Nelly Furtado's Loose, not some rare album. Then I tried manually putting the artwork - again froze and does not work. I think the artwork system is completely broken. The thing I hated most about Songbird - the sluggishness is still very much present everywhere. Whatever I try to do - change a song, access the menu, changing something in the Preferences etc. - everything too some extra seconds in the best case but generally Songbird just froze for a few minutes in most of the cases. It is not that Songbird lacks any feature I expect from a music player. 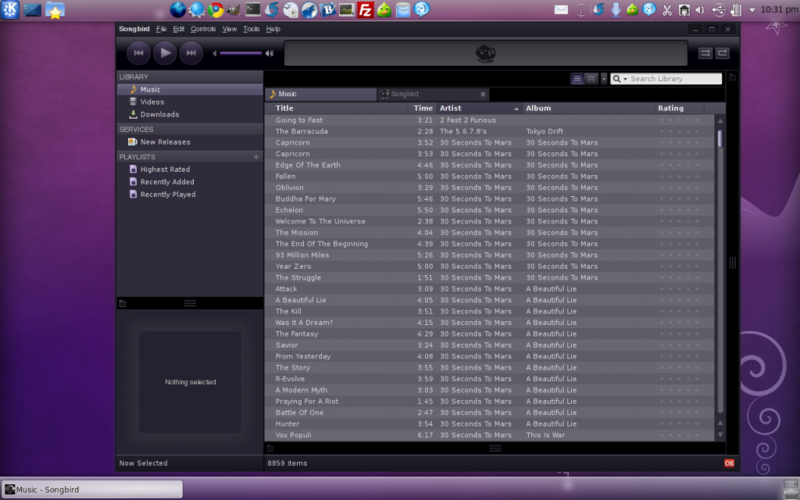 It has Last.fm integration, has a decent equalizer, library is not too bad etc. The video player does not seem to work though. But none of those features matter because of its sluggishness. So, Songbird 1.8.0 is the same bloated application that it has always been. Its sluggishness in doing everything makes it impossible to not hate. It is no longer officially supported and you are better of with another music player. Maybe try Clementine - it is evolving beautifully.